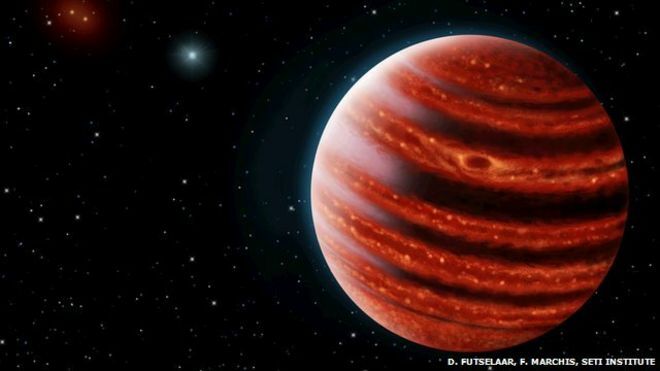 A planet 100 light-years away resembles an infant version of Jupiter, astronomers say. The new world, known as 51 Eridani b, is only 20 million years old - a toddler by astronomical standards. 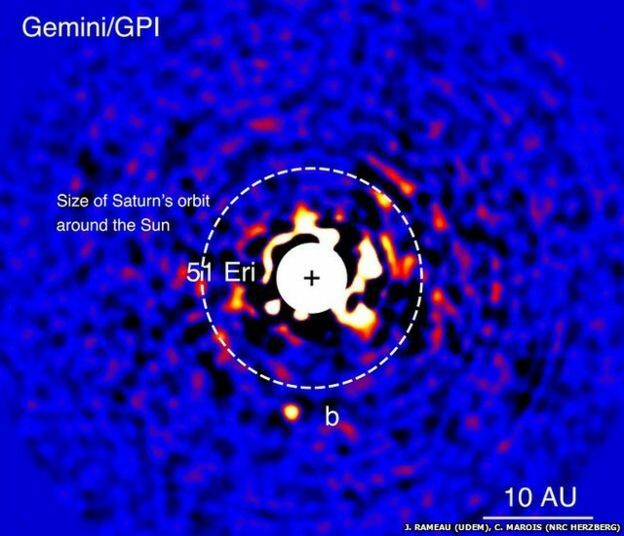 The find was made by the Gemini Planet Imager (GPI), which looks for faint, young planets orbiting bright, relatively nearby stars. The new world shows the strongest methane signature ever detected on an alien planet. Previous Jupiter-like exoplanets have shown only faint traces of methane, making them very different from the heavy methane atmospheres of gas giants in our Solar System. The astronomers also detected water, using GPI's spectrometer instrument. These findings indicate that it might be similar to planets in our Solar System, yielding additional clues to the formation of giant, astronomical bodies. The vast majority of alien solar systems that have been discovered are very different from our own, with massive planets - so-called "hot Jupiters" - orbiting close to their stars. This is partly because such systems are easier to detect with the techniques currently used to search for planets orbiting distant stars. "Previous search methods couldn't find systems like our own, with small, rocky worlds close to their star and large, gas giants at large distances like Jupiter and Saturn," said co-author James Larkin, from the University of California, Los Angeles (UCLA). "The search for large planets at large separations from their star is exactly the goal of GPI. These solar systems are likely much more similar to our own." Studying such worlds should reveal how common our Solar System architecture truly is. Astronomers believe the gas giants in our Solar System formed slowly - by building up a large core over a few million years and then pulling in a huge amount of hydrogen and other gases to form an atmosphere. This is known as a "cold-start". But the Jupiter-like exoplanets that have been discovered so far are much hotter than models have predicted. This hints that they could have formed quickly - as gas collapses to make a scorching planet in what is known as a "hot-start". The core build-up process can also form rocky planets like the Earth. But the fast collapse process might only make giant gas planets. The planets in our Solar System are 4.5 billion years old, but at just 20 million years old, 51 Eridani b might be young enough to reveal clues about how it was created. "This planet really could have formed the same way Jupiter did; the whole solar system could be a lot like ours," said co-author Bruce Macintosh, from Stanford University's Kavli Institute. The new gas giant is roughly twice the mass of Jupiter. Until now, the gas giant planets that have been directly detected have been much larger - five to 13 times Jupiter's mass. It orbits a little further from its parent star than Saturn does from the Sun and has a temperature of 430C (800F), hot enough to melt lead, but still rather cold compared with other alien gas giants, which reach temperatures above 540C (1,000F). 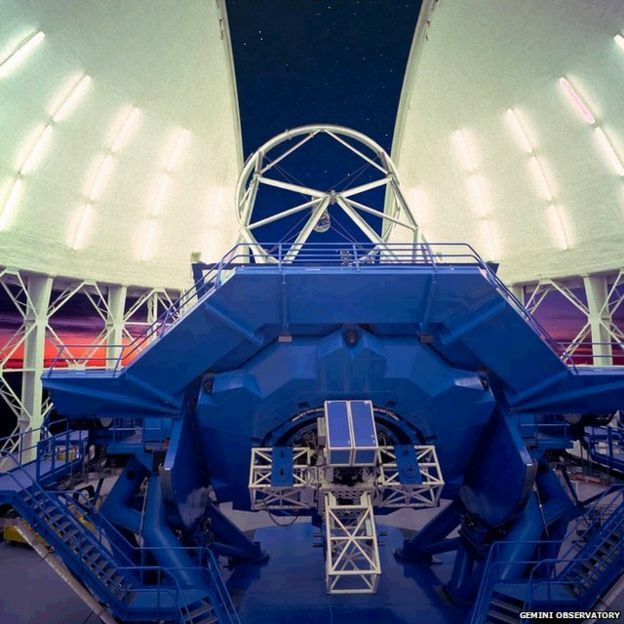 The Gemini Planet Imager is installed on the 8m Gemini South Telescope in Chile. It began science operations in 2014. Other scientific instruments designed to detect exoplanets do so indirectly, by, for example, detecting the dip in starlight as a planet passes in front of its parent sun. GPI instead searches for light from the planet itself - referred to as direct imaging. The astronomers use adaptive optics to sharpen the image of a star, and then block out the starlight. Any remaining incoming light is then analysed, with the brightest spots indicating a possible planet.